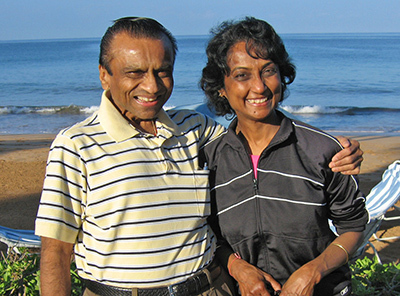 The Chhedas came to the U.S. from India, in pursuit of a better life. Madhu was working as an Ultrasonagrapher in a hospital and her husband Pravin was working as chemist. Due to health challenges, Pravin had to leave his job and started working in sales. It was at that point that good friends of theirs introduced them to an opportunity to build their own business. Working so many hours in sales, Pravin immediately understood the value of time. He would much rather spend time with his family than on sales calls, and was also excited about the opportunity to provide them with a better life. They would also be able to work together to build a business. Madhu and Pravin both understood very well that if either of them lost their ability to work, they wouldn’t have a job. Despite their hard work and long hours, they had no security and that thought gave them even more motivation to build their business. Sadly, in October 2008 Pravin passed away. Madhu misses him very much, but she continues their journey, building a business for the whole family. Leading by example and never losing her giving spirit, Madhu is excited to transfer her dreams, goals, and work ethic to her son Jinen and daughter-in-law Pankti. Madhu is very proud of her children and is eager to help them make their own dreams come true. As Madhu has achieved success in her business, she also gives her time and energy supporting worthwhile charities. She is especially active supporting Easter Seals and the U.S. Dream Academy due to the programs these organizations have developed to meet the needs of children and returning veterans. Madhu truly understands the value of helping others and have made it a priority in her life. Madhu loves the business that she and Pravin built. The business is her life and she is excited to share it with family, friends and many new friends to come.